How do we know the Einsatzgruppen murdered Jews because they were Jews, not because the Nazis thought they were partisans? The Jews were murdered because they were partisans, not because they were Jews. The Nazis’ own words and actions make it clear that the vast majority of Jews were murdered simply because they were Jews. The sheer number of Jews murdered by the Einsatzgruppen (1,150,000) does not support the idea that Jews were largely killed as partisans. Jews made up only 10 percent of all partisans in 1944. One would have had to murder all partisans, Jews and non-Jews, three times over to even get close to the number of Jews that the Einsatzgruppen murdered. Further, if Jews were actually killed in larger number because they were partisans, there is still no way to rationalize how the Einsatzgruppen murdered Jews so indiscriminately, including women, children, infants, elderly, and the infirm. A partisan is a member of irregular military force that opposes military occupation through underground activities. In the Soviet Union, partisan units were composed of soldiers from the Soviet army, Communists, and civilians. These partisans fled to the woods and took up arms against the German occupation forces. 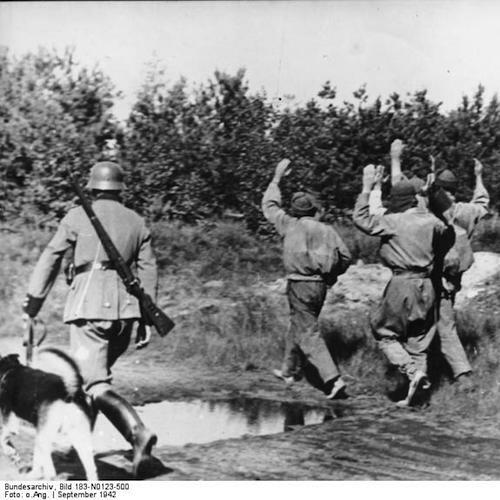 Those Jews who managed to make it into the forest usually joined a non-Jewish unit, but there were a few entirely Jewish partisan units as well. How many partisans were there in the Soviet Union? The exact number of partisans (including Jews) in the occupied Soviet territories is impossible to know with any certainty. Why? By definition, partisans were underground fighters, loosely organized, fluid in their membership, and hidden. Kenneth Slepyan, a scholar of the Soviet partisan movement, informs us that, according to Soviet wartime figures, by the end of 1941 German opposition had nearly destroyed the fledgling partisan movement. However, in 1942, the movement began to recover and, as of June 1942, there were almost 70,000 partisans. By August 1942 that number had grown to 93,000; by February 1943, it had grown to over 120,000. Slepyan notes, however, that the Soviet figures are incomplete. Yitzhak Arad, a respected scholar who studies the Holocaust in the Soviet Union, estimates that there were 200,000 to 250,000 partisans by 1944 (and perhaps as many as 350,000). By this time, partisans operated in hundreds of brigades, of which about 20,000 to 25,000 partisans were Jews. On the basis of these numbers—the best available at present—it appears that Jewish fighters were about 10 percent of the entire partisan movement. First and foremost, the sheer number of Jews murdered by the Einsatzgruppen (some 1,150,000) does not support the claim Jews were killed because they were partisans. Ronald Headland, in Messages of Murder, concludes: “The statistical record of the killing rose beyond any plausible association with the norms of mere police work.” Further, there is no way to rationalize the murder of Jewish women, children, and infants as partisans. What does Jäger Report tells? These are just three examples from Jäger’s report, which listed 113 separate operations in 71 different locations. The total number of Jews “liquidated” by his unit in just five months was 137,346. Jäger’s report shows that Holocaust denier Jürgen Graf’s “wild shootings” theory is unsupported by the evidence. The murder of the Jews in the East was the state-sanctioned, systematic, and thorough destruction of every last Jew in every last community. The story is the same across the areas occupied by all four Einsatzgruppen. Eventually, the Germans stopped bothering to give a “reason” at all. Thus, the Nazis’ own documents often did not assert that Jews were killed because they were partisans, but reveal they were killed because they were Jews. Captured Soviet partisans. Bundesarchiv, Bild 183-N0123-500 / CC-BY-SA 3.0, via Wikimedia Commons. The claim of Holocaust deniers, that the Nazis shot Jews because they were partisans, does not stand up under scrutiny. The Nazis’ own words and documents make it clear that the vast majority of Jews were murdered because they were Jews. Nor was it a matter of “wild shootings,” but the shootings were state-sanctioned, systematic, and thorough annihilation of every last Jew in every last community that the Einsatzgruppen could reach. The perpetrators include Higher SS Police Leaders and their staff, police battalions, and their local helpers. Jürgen Graf, The Giant With Feet of Clay: Raul Hilberg and his Standard Work of the “Holocaust,” p. 36 at http://vho.org/GB/Books/Giant/Chapter5.pdf. Jürgen Graf, The Giant With Feet of Clay: Raul Hilberg and his Standard Work of the”Holocaust,” p. 36. Arthur R. Butz, The Hoax of the Twentieth Century: The Case Against the Presumed Extermination of European Jewry (“Chapter 6: Et Cetera”) at http://vho.org/GB/Books/thottc/10.html. Kenneth Slepyan, Stalin’s Guerillas: Soviet Partisans in World War II (University Press of Kansas, 2006), pp. 51-59. Yitzhak Arad, The Holocaust in the Soviet Union (University of Nebraska Press, 2009), p. 515 and Allen Levine, Fugitives of the Forest: The Heroic Story of Jewish Resistance and Survival During the Second World War (Lyons Press, 1998), p. xxi. Ronald Headland, Messages of Murder: A Study of the Reports of the Einsatzgruppen of the Security Police and the Security Service, 1941-1943 (Fairleigh Dickinson University Press, 1992), p. 78. You may read the “Jäger Report” at https://fcit.usf.edu/holocaust/resource/document/DocJager.htm. Yitzhak Arad, Shmuel Krakowski, and Shmuel Spector (editors), The Einsatzgruppen Reports: Selections from the Dispatches of the Nazi Death Squads’ Campaign Against the Jews in Occupied Territories of the Soviet Union, July 1941-January 1943 (Holocaust Library, 1989), p. 100. Yitzhak Arad, Shmuel Krakowski, and Shmuel Spector (editors), The Einsatzgruppen Reports: Selections from the Dispatches of the Nazi Death Squads’ Campaign Against the Jews in Occupied Territories of the Soviet Union, July 1941-January 1943 (Holocaust Library, 1989), p. 140. See also http://www.holocaustresearchproject.org/einsatz/situationreport88.html (Operational Situation Report USSR No. 88). Yitzhak Arad, Shmuel Krakowski, and Shmuel Spector (editors), The Einsatzgruppen Reports: Selections from the Dispatches of the Nazi Death Squads’ Campaign Against the Jews in Occupied Territories of the Soviet Union, July 1941-January 1943 (Holocaust Library, 1989), p. 152. Yitzhak Arad, Shmuel Krakowski, and Shmuel Spector (editors), The Einsatzgruppen Reports: Selections from the Dispatches of the Nazi Death Squads’ Campaign Against the Jews in Occupied Territories of the Soviet Union, July 1941-January 1943 (Holocaust Library, 1989), pp. 205, 206. Yitzhak Arad, Shmuel Krakowski, and Shmuel Spector (editors), The Einsatzgruppen Reports: Selections from the Dispatches of the Nazi Death Squads’ Campaign Against the Jews in Occupied Territories of the Soviet Union, July 1941-January 1943 (Holocaust Library, 1989), p. 307. See also http://www.holocaustresearchproject.org/einsatz/situationreport178.html (Operational Situation Report No. 178).